Headaches and migraine are among the most common challenges that people deal with in Singapore. Possibly due to the fast-paced and stressful nature of our daily lives, headaches are becoming increasingly more widespread. 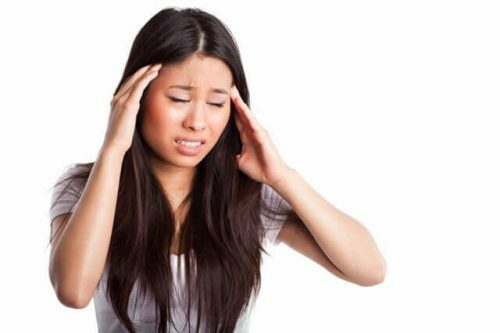 If you are dealing with headaches or migraines, you are not alone, as we see a lot people in our chiropractic centers with these problems. Download the ” The Ultimate Guide to Migraine and Headache Relief ” TODAY! We have had great success in solving the headache riddle for many people. Read on to learn more. Headaches come in a variety of shapes and sizes. For many people, when a headache strikes it can be extremely debilitating. Often, people feel tired, irritable, and frustrated when the pain flares up. Suffering through pain can have a dramatic effect on a person’s life. Their motivation at work may lag and as a result their productivity may diminish—they get less done throughout the day. They may have less patience with their family, feel like they are on the brink of lashing out in anger at times, and often just want to be left alone. A headache can be a tipping point of sorts, ruining a happy and productive day. Clearly, you are looking for results or you wouldn’t have found your way to our website. Often, when people are looking to solve a headache problem, one of the first things they research is how headaches are categorized or classified. They want to know what type of headache they have. Maybe you have been labelled with one of these types of headaches. 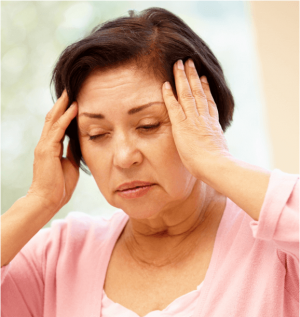 While understanding the names and characteristics of the different types of headaches can be helpful, what is far more important is understanding what is causing your headache. Once you define the cause, then you can work to correct it. You are likely wondering how chiropractic can help you with your headache or migraine problem. Let’s discuss some basic concepts. There is an important relationship between the alignment of your neck (your cervical spine) and the function of your nervous system. 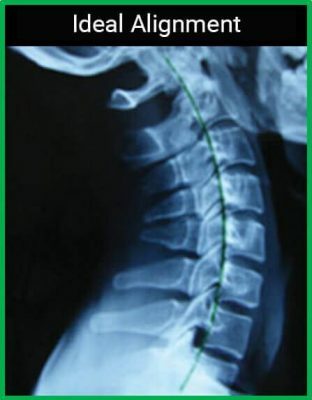 Your neck is part of your spine; in fact, your neck is known as your cervical spine. Your spine works to support your body and protect your nervous system. Think of your nervous system as the master wiring system of your body that coordinates and controls the millions of body functions that occur every moment of your life. When your spinal bones fall out of alignment, become tight, restricted and locked out of place, those misaligned bones will irritate the nerves and tissues associated with that spinal region. Spinal misalignments are known as a subluxations. 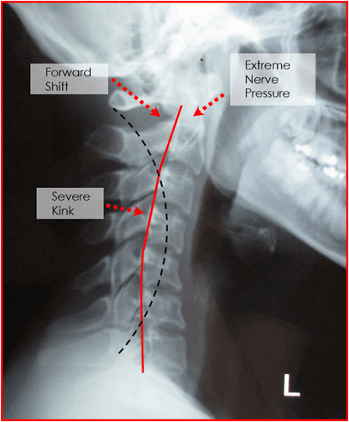 As seen from the side, your neck area (cervical spine) needs to be curved. Have a look at the example below. When your neck has this good, curved alignment, you will often have good flexibility, proper posture, very little muscle tension, and limited pain in your neck and head. Most importantly, the nerves of your upper neck will function well. You may not directly feel your nerves functioning. But the nerves of your upper neck directly supply your eyes, ears, nose, skull and the blood flow to your brain among many other areas. Feeling congested, dizzy, having blurry vision, ringing ears are all signals that your neck is not aligned, hampering the flow of your nerve supply. 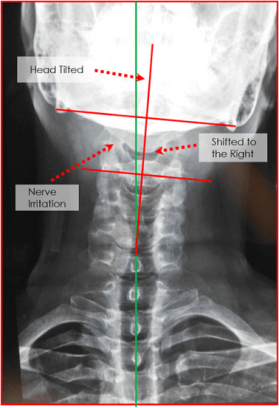 Below, you can see a severely misaligned neck. This is known as a subluxation in the cervical spine. We are seeing a reversal misalignment, and forward shift of this person’s head in this example. This will lead to extreme irritation and stress to the nerves of the upper neck. Their muscles will likely become tight, stiff and inflamed. This person will have restrictions in their movement, often they will not be able extend, bend or rotate their head to one side. In this case, the cause of this person’s headache is a subluxation, a spinal misalignment, and the stress that causes to the person’s nerve system. The key thing to understand is that when your spine is out of alignment (subluxated), your nervous system gets damaged. Impaired nerve function can cause a wide-variety of related problems. Nerve irritation can inflame and irritate muscles. Muscle tension and pain can radiate into the back of your head, your jaws, temples and the front of your skull. Nerve irritation can affect blood flow to your brain causing confusion, irritability and deep, throbbing pain. As a result, congestion and pressure can accumulate in your sinus’s affecting your breathing. Your vision may become blurry and impaired due to the nerve irritation as well. Above all your head may hurt. Schedule a no-obligation spinal checkup to see if your headaches are caused by a misaligned spinal bone and nerve irritation. From behind, this person’s spine should be straight and their head should be level. In this example, you can see that their upper neck was shifted to the right and their head was locked and rotated to the right side as well. This was creating tension and pressure in their upper neck muscles, and significantly affecting the nerves of their upper neck region. This person was dealing with daily tension headaches, chronic fatigue, ringing in the ears, and weakened immune system. They were falling sick frequently. As a result, they were restricted at work and at home with their family. As we were able to improve their spinal alignment and restore the balance to their nerve system, these body signals resolved and they were able to function better in their life. Do you have to regularly take panadol, painkillers, and muscle relaxants , and muscle relaxants to get through the day? Are you tired of temporary “quick fixes” that don’t last? Medication and drugs only mask the symptom, dulling the pain without resolving the root cause of the problem. If the cause of your headache condition is a structural problem in your spine, then the only way to achieve lasting improvement is through chiropractic care. You need to realign your spine and relieve the stress to your nervous system. So if you are dealing with headaches or migraines, what should you do? The first step is to always have your spine checked to understand what is causing your pain, and to see if chiropractic is the right approach for you. By naturally restoring the alignment of your spine and improving the health of your nerve system we can help you feel better and live better. We have helped a lot of people with similar problems. There is hope. There is no reason to continue dealing and living with these challenges. Nor should you live numbing your body further with ineffective temporary relief. Read more about it on 5 Silent Ways PAIN May be Costing You. We locate the root cause, and by targeting that in the care we provide, we are able to help people live to their full health potential. Schedule a no-obligation spinal checkup to find the cause of your headaches. It all starts with a checkup. Make a change today!